One narrow tail on hindwing. 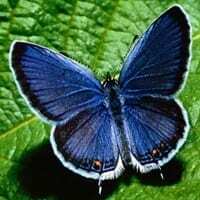 Upperside of male iridescent blue; summer females uniformly brown, spring females smaller with much blue at the wing bases. Underside of hindwing pale gray with black bar at end of cell, distinct black spots, and three large orange spots at outer margin near tail.